The University of Central Oklahoma Hockey team after sweeping Arizona and Arizona State last weekend, completed the 6 games in 10 days with another sweep of Colorado and Colorado State. 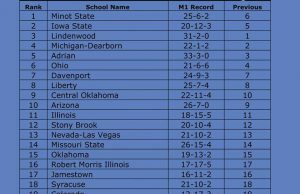 In Thursday night’s game, the Colorado Buffaloes came into the contest ranked 5th in the nation and had the WCHL title on the line if they could defeat UCO. But the Bronchos had title hopes of their own and beat the Buffaloes 3-2. 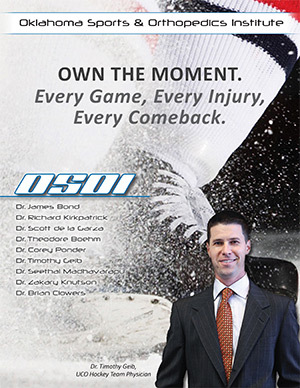 Brandon Formosa scoring twice and Josh Wyatt adding in the game winning goal. All the hard work and the big victory against the Colorado Buffaloes would all be for nothing if the Bronchos didn’t complete the weekend with victories against the feisty Colorado State Rams. 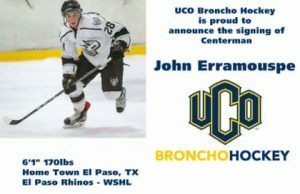 After a scoreless first period in Fridays game, the Bronchos opened up the scoring and never looked back taking Friday nights game 6-1 with six different Bronchos scoring and then with Alex Henry shutting out the Rams, UCO dominated the Saturday contest 5-0. 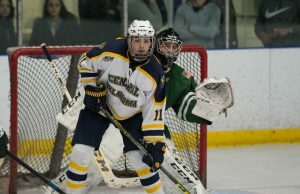 With the victories the UCO Bronchos secured their third WCHL title in three seasons. 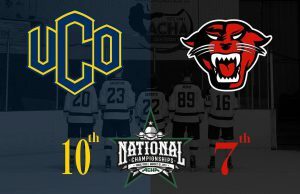 A first for the WCHL and keeps the Bronchos on pace for a possible top 4 ranking in the National Championship tournament with four games remaining. The Bronchos will have their final home game against their bedlam rival, the University of Oklahoma this Friday night at 7:30pm. The Bronchos will honor their seniors before the start of the game.